Acts of Knowledge: History, Philosophy and Logic. The Editors’ vision for this volume is that it should be a selection of essays, contributed by the academics who have worked, studied, collaborated and disagreed with Göran Sundholm; engaging in debated issues and exploring untouched areas maybe only suggested or hinted at in Sundholm’s own work. "Acts of Knowledge" characterizes the papers contained in this volume as bringing something scientifically valuable in their respective fields: all the papers present cutting-edge research in their own style, contributing to very lively debates occurring in the literature in logic, philosophical logic and history of logic. But it also hints at Göran’s constructivist background, which has been an influence or a challenge for many of the contributors. 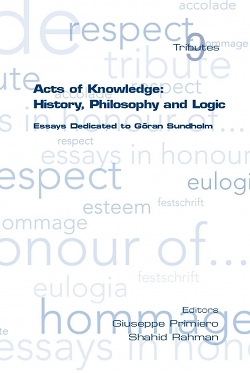 "History, Philosophy and Logic" refers directly to Göran's broad interests into the various aspects of the Philosophy of Logic, Mathematics, and Language, their origins and development, especially with the focus on the Modern History of Logic and the philosophical implications thereof. The readers will find scattered all along this volume pieces of -- and reflections on -- all these themes.